This article is based on research from a forthcoming report about Oregon’s Patriot movement, which will be published by the Rural Organizing Project and Political Research Associates. In the wake of the armed occupation of the Malheur National Wildlife Refuge in January and February 2016, a slew of candidates linked to the so-called Patriot movement are running for office in Oregon, including in the upcoming May primary. Even though most of the actual occupiers were from out of state, the occupation highlighted the state’s large and growing Patriot movement. These often-armed, Hard Right activists organized the initial demonstration that preceded the occupation and helped build political support for the occupiers’ demands. These demands included the transfer of federally owned public lands to state or county governments in order to avoid land-use restrictions, as well as attempts to circumvent the federal government’s decision-making powers by invoking legally groundless claims about the authority of state and county governments. Patriot Movement-affiliated candidates and elected officials are in several Oregon counties. The arrest of over two dozen people connected to the Malheur occupation, in addition to the death of occupier Robert “LaVoy” Finicum at the hands of law enforcement, has energized the movement—which now has a new martyr and opportunities for activism to support their newly minted political prisoners. For the last few years, the state’s Patriot movement largely focused on non-electoral movement building; some county sheriffs and a handful of other officials were affiliated with its aims, but by and large it remained outside of the electoral arena. This is changing with Oregon’s May 17, 2016 primary election. In several counties where Oregon’s Patriot movement is strong—including Josephine, Crook, Baker, Douglas, and Harney—candidates tied to the movement are running for office. These candidates include key Patriot movement leaders such as Joseph Rice, as well as Republicans who are courting the movement for votes. The Patriot movement is a Hard Right movement that is trying to radically transform U.S. political and legal institutions. It seeks to implement a form of right-wing decentralization, including the abolition of environmental laws and the social safety net, replacing them with almost completely unrestricted capitalism, all based on an idiosyncratic reading of the Constitution and various conspiracy theories which support their political views. The best known of the movement’s tactics is the formation of paramilitaries—traditionally “militias,” but more recently including other, more decentralized, armed approaches. The movement also promotes the concept of “coordination”: the false idea that federal agencies must comply with county government plans regarding land-use decisions, usually about natural resource extraction on federal lands that are within a county’s borders. Coordination is a new form of “county supremacy,” an idea popular in the 1990s that is re-emerging.2 By 1996, 70 counties had passed laws attempting to gain control over federal lands.3 (This is based on the idea that removing restrictions on natural resource extraction will revive moribund rural economies.) In the end, these county governments only wasted their energies tilting at windmills, instead of working on constructive solutions to local problems. Related to this, many in the movement believe the federal government has no legal right to own most public land, which they think should be transferred to state or county control. All of these positions reflect hostility toward the federal government, which is not uncommon in the rural West. Because of the movement’s political focus on the county, it is not surprising that this year’s crop of Patriot-friendly candidates are largely seeking seats at the county level. The most important Oregon Patriot movement groups today are those associated with the Oath Keepers, the Three Percenters, the Constitutional Sheriffs and Peace Officers Association (CSPOA), and the Pacific Patriots Network. The Oath Keepers are a national membership-based organization that recruits current and former police, military, and first responders; however others can still be “associate members.” Members swear to disobey government orders they claim are unconstitutional, but these are mostly staple right-wing conspiracy theories such as federal government plans to disarm civilians before herding them into concentration camps. The CSPOA is composed of standing law enforcement members and is affiliated with the Oath Keepers. Their founder, former county sheriff Richard Mack, believes the county sheriff has the authority to interpret the Constitution, and therefore decide which laws should be enforced. The Three Percenters are a somewhat decentralized militia; individuals can identify with the label, but in some places, including Oregon, there are also organized groups with leadership structures. Some individual Three Percenters were involved in the Malheur occupation.4 The Pacific Patriots Network is a network of nine “partner” groups, mostly based in Oregon and Idaho, including the Oath Keepers of Josephine County and both the Oregon and Idaho Three Percenters. The Pacific Patriots Network became infamous for their third-party activities around the Malheur occupation in Burns, Oregon—the town just outside the refuge.5 Their members organized the initial January 2, 2016 march that the occupation came out of; held events and meetings in Burns to promote Patriot movement ideology; deployed armed members in the town; and helped bring supplies to the refuge. This allowed them to try to position themselves as a neutral party while really playing “good cop” to the occupiers’ “bad cop,” and raising their public profile at the same time. State Representative Carl Wilson (District 3) was praised by the Oath Keepers for writing a letter in support of miners who established armed encampments at the Sugar Pine Mine in Josephine County, Oregon in spring 2015 over a land use conflict with the Bureau of Land Management (BLM).9 This incident is seen as a precursor to the Malheur occupation. In addition to the currently serving officials, there are at least fourteen Patriot movement affiliated candidates running for Oregon office—although there are undoubtedly more who have escaped our attention or are hiding their affiliations. Most candidates are running in the May primary, although some races will be decided in the November election. These include candidates who are Patriot movement activists; those who are directly courting or endorsed by Patriot groups; and those promoting the movement’s radical political positions including nullification, coordination, and sympathy with the Malheur occupation. Last, Mandi Jacobs, a Patriot movement activist, is a write-in candidate to be a Republican Party Precinct Committee Person in Douglas County’s Precinct 17—despite the fact that she has not been registered as a party member for the required period to be eligible.54 Her run for this low-level elected position is of note because it represents part of a bottom-up, rather than a top-down, approach to taking over political institutions—an approach which can be seen reflected across the Patriot movement’s strategies. The Patriot movement in Oregon has shown that it can grab headlines through the use of armed action. It will be seen this May and November whether it can capture political power at the ballot box as well. If they successfully gain county-level seats across the state, we can expect confrontations around federal land transfer, nullification, and coordination. These actions will attempt to short-circuit existing democratic structures and circumvent federal laws (especially environmental restrictions), and Patriot movement-affiliated county officials will help create a welcoming environment for further right-wing paramilitary activities in the state. Unless otherwise noted, all online citations are accessible as of April 19, 2016. 1) The origin of this idea is usually attributed to Posse Comitatus, a decentralized Christian White supremacist group. See Daniel Levitas, The Terrorist Next Door: The Militia Movement and the Radical Right (New York: Thomas Dunne Books/St. Martin’s Press, 2002). 2) There is an actual federal rule called “coordination,” but it has a different meaning, and does not grant counties the right to dictate land-use decisions to federal agencies. See Montana Human Rights Network, “Recycled County Supremacy Gains Traction, Lacks Legal Basis,” November 2, 2012, http://www.mhrn.org/publications/specialresearchreports/MHRN%20Report%20-%20Coordination.pdf. 3) Kenneth S. Stern, A Force Upon the Plain: The American Militia Movement and the Politics of Hate (Norman, OK: University of Oklahoma Press, 1997), 125. 4) Rachel Tabachnick, “Profile on the Right: Oath Keepers,” Political Research Associates, April 23, 2015, https://www.politicalresearch.org/2015/04/23/profile-on-the-right-oathkeepers; Political Research Associates, “Profiles on the Right: Constitutional Sheriffs and Peace Officers Association,” November 22, 2013, https://www.politicalresearch.org/2013/11/22/profiles-on-the-right-constitutional-sheriffs-and-peace-officers-association; Spencer Sunshine, “Profiles on the Right: Three Percenters,” Political Research Associates, January 5, 2016, https://www.politicalresearch.org/2016/01/05/profiles-on-the-right-three-percenters. 5) “Partners,” Pacific Patriots Network, http://www.pacificpatriotsnetwork.com/partners.php; OPB Staff, “New Armed Group Enters Harney County, Meets With Sheriff,” OPB, January 9, 2016, http://www.opb.org/news/series/burns-oregon-standoff-bundy-militia-news-updates/armed-convoy-arrives-at-harney-county-courthouse. 6) Stern, A Force Upon the Plain, 212–17. 7) CSPOA, “The Leadership—CSPOA Council of Sheriffs, Peace Officers and Public Officials,” https://web.archive.org/web/20150820114146/http://cspoa.org/about/leadership, archive from August 20, 2015; Jonathan Thompson, “The rise of the Sagebrush Sheriffs,” High Country News, February 2, 2016, https://www.hcn.org/issues/48.2/the-rise-of-the-sagebrush-sheriffs; George Plaven, “Grant County sheriff demands coordination with Forest Service,” East Oregonian, October 9, 2015, www.eastoregonian.com/eo/local-news/20151009/grant-county-sheriff-demands-coordination-with-forest-service; Les Zaitz, “State licensing board seeks investigation of Grant County sheriff who met militants,” Oregonian/OregonLive, February 18, 2016, http://www.oregonlive.com/oregon-standoff/2016/02/state_police_board_seeks_inves.html. 8) John Sepulvado, “Oregon Lawmaker Says Roseburg Shooting Prompted ‘Fact-Finding’ Visit To Armed Occupation,” OPB, March 20, 2016, http://www.opb.org/news/series/burns-oregon-standoff-bundy-militia-news-updates/roseburg-shooting-republican-politician-dallas-heard-occupation-visit. The refuge trip that Representative Heard went on was organized by COWS (Coalition of Western States), but he says that he is not a member of the group. 9) The Facebook account of the Oath Keepers of Oregon posted, “Every Politician should be supporting the miner’s rights or else they are violating their oath. At least Oregon state Rep. Carl Wilson Supports Miners’ Access To Due Process:,” May 15, 2015, https://www.facebook.com/OathKeepersofOregon/posts/686948074750130. The Josephine County Oath Keepers also posted Representative Wilson’s press release on their site; see “Rep. Carl Wilson Supports Miners’ Access To Due Process,” April 28, 2015, http://oathkeepersjoco.com/downloads/Rep-Carl-Wilson-Supports-Miners-Access-To-Due-Process.pdf. 10) Joshua Dillen, “County, Forest Service discuss coordination,” Baker City Herald, October 2, 2015, http://www.bakercityherald.com/Local-News/County-Forest-Service-discuss-coordination; Jayson Jacoby, “Message Delivered,” Baker City Herald, February 8, 2016, http://www.bakercityherald.com/Local-News/Message-Delivered. 11) Nicole Montesano, “Commissioners urged to help calm Malheur tension,” Yamhill Valley News Register, January 28, 2016, http://newsregister.com/article?articleTitle=commissioners-urged-to-help-calm-malheur-tension–1454029836–20827–. Starrett is also a former Constitution Party official and candidate. 12) Tay Wiles, “Sugar Pine Mine, the other standoff,” High Country News, February 2, 2016, http://www.hcn.org/issues/48.2/showdown-at-sugar-pine-mine. 13) “Senator Kim Thatcher—‘I will not comply!’—SB 941 Protests” (video), YouTube, uploaded May 31, 2015, https://youtu.be/3oe3co_tHfU; “Bill Post—‘I will not comply’ SB 941” (video), YouTube, uploaded May 31, 2015, https://youtu.be/Ycbey1VMyCQ; “Mike Nearman—‘I will not comply’—SB 941” (video), uploaded May 31, 2015, https://youtu.be/ystyU-kv5J4. For Vanderboegh, see “We Will Not Comply Rally—Salem, Oregon—May 30, 2015” (video), YouTube, uploaded July 3, 2015, https://youtu.be/sDD7GZJLSkE. His call for “civil war” is around 57:15, and comments on Governor Kate Brown around 1:04:40. 14) For example, he is speaking to the Douglas County Oath Keepers on April 15, 2016 as publicized on their Facebook page, March 22, 2016: http://www.facebook.com/oathkeepers/posts/468874663307449. 15) “Strategies to Return Local Control to the Communities and Voters of Oregon,” Bruce Cuff for Governor of Oregon, http://www.time4cuff.co/strategies-to-return-local-control.html, accessed April 17, 2016. 16) “Oregon is a Sovereign State!,” Bruce Cuff for Governor of Oregon, http://www.time4cuff.co/oregon-is-a-sovereign-state-.html, accessed April 17, 2016. 17) KOIN 6 News Staff, “Shouts of support, waves for jailed Bundy brothers,” KOIN6, March 5, 2016, http://koin.com/2016/03/05/shouts-of-support-waves-for-jailed-bundy-brothers; “BLM Protest Wardo interviews Bruce Cuff and J D Parks Oregon 3/26” (video), YouTube, uploaded April 1, 2016, https://youtu.be/qQyF7wamshU. See starting at 2:27. 18) “Oregon 2016 Election Center,” Washington Times, http://m.washingtontimes.com/elections/OR/profile. 19) Montana Human Rights Network, The Constitution Party of Montana: The Radical Right Wing’s Collision with Mainstream Politics, third edition, 2009 (originally 2000), http://www.mhrn.org/publications/specialresearchreports/CPOM%20Updated%20report.pdf, 9–13, 63–64. 20) “Platform of the Constitution Party of Oregon,” The Constitution Party of Oregon, http://www.constitutionpartyoregon.net/platform_of_the_constitution_par.htm; see also, Constitution Party of Oregon’s Facebook post from January 10, 2016, https://www.facebook.com/ConstitutionPartyOfOregon/posts/561405287347989. 21) Oregon Secretary of State, “November 4, 2014, General Election, Official Abstract of Votes,” http://sos.oregon.gov/elections/Documents/results/results-2014-general-election.pdf. 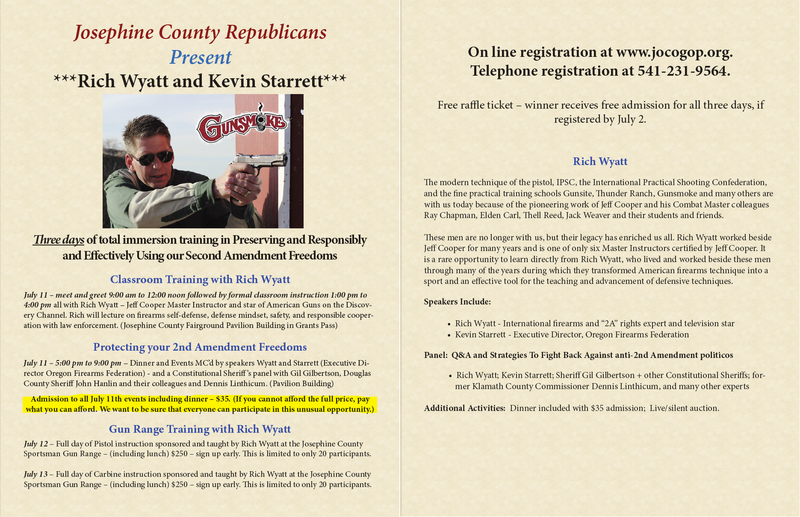 22) “Josephine County Republicans Present Rich Wyatt and Kevin Starrett,” 2015, https://jocogop.files.wordpress.com/2015/06/richwyatt.png; Dennis Linthicum, “BLM v Hammond—A Blind Pimple Or Worse?,” Dirt Road Economist, November 23, 2015, http://www.dirtroadeconomist.com/2015/11/23/blm-v-hammond-a-blind-pimple-or-worse; “Absolute Power is not Easily Tamed,” Dirt Road Economist, January 28, 2016, http://www.dirtroadeconomist.com/2016/1/28/absolute-power-is-not-easily-tamed. 23) “Oregon—Summary Vote Results,” May 21, 2014, http://hosted.ap.org/dynamic/files/elections/2014/by_state/OR_US_House_0520.html. 24) “March 2016” calendar, http://www.perkins4oregon.com/Calendar/Events/2016/03.aspx; “Meet with Jo Rae Perkins,” Facebook event, http://www.facebook.com/events/890834391033614, accessed April 1, 2016; screenshot in possession of author. The 912 Project was founded by Glenn Beck. 25) Ian K. Kullgren, “Election 2016: Who’s running for office in Oregon? Portland? We’ve got your list right here,” Oregonian/OregonLive, March 09, 2016, http://www.oregonlive.com/politics/index.ssf/2016/03/candidate_list_final_2016.html. 26) “Issues,” http://www.perkins4oregon.com/Issues.aspx, accessed April 17, 2016. 27) “Charmaign ‘Sis’ Edwards for Harney County Commissioner,” March 30, 2016, http://www.facebook.com/Edwards4Commissioner/posts/1750781981820909; Karina Brown, “Residents Mixed on Bundy Militia’s Takeover,” Courthouse News Service, January 7, 2016, http://www.courthousenews.com/2016/01/07/residents-mixed-on-bundy-militias-takeover.htm. 28) We the People—United Individuals of these States United: Coalition of Western States (COWS), Pacific Patriot Network (PPN), Bundy Family and Supporters, Oregon Oath Keepers, Idaho III%, Central Oregon Constitutional Guard, Oregon Tactical, Oregon Bearded Bastards, Liberty Watch Washington, Nevada Committee for Full Statehood, Rural Heritage Preservation Project, Liberty For All (LFA), etc., “NOTICE: Redress of Grievance – December 11, 2015,” http://holdingblock.blogspot.com/2015/12/we-people-united-individuals-of-these.html. 30) http://www.facebook.com/charmaign.edwards; see February 21, 2016 post. 31) Caitlin Dickson, “In Oregon occupation, residents choose sides on social media—and things get ugly,” Yahoo News, January 11, 2016, http://www.yahoo.com/news/in-oregon-occupation–residents-choose-sides-on-social-media%E2%80%94and-things-get-ugly-202711268.html; “About,” http://www.facebook.com/Annajoforjudge. 32) Trent Loos’ Podcast, “Loos Tales for Jan 11, 2016 Anna Jo Surber works at the The Narrows,” January 10, 2016, http://trentloos.podomatic.com/entry/2016-01-10T05_07_40-08_00. See around 1:40, 3:00, and 3:38. 33) “Anna Jo Surber Running For Commissioner In Harney County Oregon— #OregonFront,” January 26, 2016, http://www.youtube.com/watch?v=FbO9rSXn2RE. See around 7:44. 34) Bill Morlin, “‘Constitutional Sheriff’ Richard Mack Hoping to Capitalize on Oregon Standoff,” February 16, 2016, http://www.splcenter.org/hatewatch/2016/02/16/%E2%80%98constitutional-sheriff%E2%80%99-richard-mack-hoping-capitalize-oregon-standoff. 35) Tay Wiles and Jonathan Thompson, “Who’s who inside and on the outskirts of the Malheur occupation,” High Country News, January 11, 2016, http://www.hcn.org/articles/whos-who-at-the-oregon-standoff-malhuer-bundy. 36) Josephine County Voters’ Pamphlet: Official Primary Election, May 17, 2016, http://www.co.josephine.or.us/Files/May%202016%20Primary%20Election%20VP.pdf. 37) An archived COP website says, “On September 12, 2009 two area citizens were part of the largest peaceful protest march in the history of our nation. We now recognize the Tea Party on 9/12/2009 as the genesis of COP.” See https://web.archive.org/web/20160212180928/http://www.copatriots.org. 38) “Ken Taylor,” http://www.linkedin.com/in/ken-taylor-59b24719; “Crook County,” http://www.oregonrepublicanparty.org/CrookCounty. 39) Jason Chaney, “Brookhart again running for judge,” Central Oregonian, November 24, 2015, http://www.pamplinmedia.com/ceo/162-news/282544-158473-brookhart-again-running-for-judge; “Primary Election, May 15, 2012—Official Final Results” http://co.crook.or.us/Portals/0/MayPrimary2012.pdf. 40) Aaron West, “Three running for Crook County judge,” The Bulletin (Bend), April 5, 2016, http://www.bendbulletin.com/newsroomstafflist/4186316-151/three-running-for-crook-county-judge. 41) Aaron West, “Crook County residents form a PAC to make a land use plan,” The Bulletin (Bend), February 29, 2016, http://www.bendbulletin.com/localstate/4042307-151/crook-county-residents-form-a-pac-to-make. 42) Brookhart for Crook County Judge, 2016, http://electcraigbrookhart.com. 43) “Platform,” Brookhart for Crook County Judge, 2016, http://electcraigbrookhart.com/Brookhart_for_Crook_County_Judge/Platform.html; “About Me,” Brookhart for Crook County Judge, 2016, http://electcraigbrookhart.com/Brookhart_for_Crook_County_Judge/About_Me.html. 44) Jason Chaney, “Sharp joins county commissioner race,” Central Oregonian, December 4, 2015, http://www.pamplinmedia.com/ceo/162-news/284047-159397-sharp-joins-county-commissioner-race; Aaron West, “7 up for open seat in Crook County,” The Bulletin (Bend), March 26, 2016, http://www.bendbulletin.com/newsroomstafflist/4162552-151/7-up-for-open-seat-in-crook-county. 45) Carisa Cegavske, “Susan Morgan critic J.D. Parks running for her commission seat,” NR Today, February 9, 2016, http://www.nrtoday.com/news/20566618-113/susan-morgan-critic-jd-parks-running-for-her, accessed April 1, 2016. Copy in possession of author. 46) “J.D. Parks for Douglas County Commissioner,” http://www.facebook.com/groups/781291355309827. 47) “J.D. Parks—Bringing the Constitution back at the local Level,” February 24, 2016, http://www.youtube.com/watch?v=RD4VFnFCkAY. One of Parks’s opponents is Gary Leif, who visited the Malheur occupation, but came away saying he did not support it. See Carisa Cegavske, “County commissioner candidate Gary Leif meets with protesters at Malheur National Wildlife Refuge,” NRToday, January 22, 2016, http://www.nrtoday.com/news/20276992-113/county-commissioner-candidate-gary-leif-meets-with-protesters. 48) Gina Perkins, “Coordinator of County’s Oath Keeper Group Running for Commissioner,” Record-Courier, January 28, 2016, http://www.therconline.com/#!Coordinator-of-Countys-Oath-Keeper-Group-Running-for-Commissioner/cg4a/56aa60a60cf2c295f1f2674f; Julie Turkewitzjan, “Fervor in Oregon Compound and Fear Outside It,” New York Times, January 12, 2016, http://www.nytimes.com/2016/01/13/us/fervor-in-oregon-compound-and-fear-outside-it.html. 49) “Kody Justus for Baker County Commission,” https://vimeo.com/157685693. 50) Kody Justus for Baker County Commission, http://www.justusforbakercounty.com; Jayson Jacoby, “Message Delivered, Baker City Herald, February 8, 2016, http://www.bakercityherald.com/Local-News/Message-Delivered. 51) A February 19, 2016, comment on a February 20 “Hoopes 4 Sheriff” Facebook post says he has joined CSPOA; Jayson Jacoby, “Message Delivered, Baker City Herald, February 8, 2016, http://www.bakercityherald.com/Local-News/Message-Delivered. 52) “John ‘Hoopes 4 Sheriff,’” http://www.facebook.com/John-Hoopes-4-Sheriff-1708084419467568. 53) “Sheriff candidates interviewed: John Hoopes’ answers,” March 13, 2015, http://www.bakercityherald.com/Local-News/Sheriff-candidates-interviewed-John-Hoopes-answers. 54) Facebook post, March 15, 2016; http://www.facebook.com/mandi.jacobs.3/posts/1149962291681485. This entry was posted in Eyes Right Blog and tagged candidates, elected officials, militia, militias, oregon, patriot movement, spencer sunshine by Spencer Sunshine. Bookmark the permalink. Standoffs and the Far Right: What Changed After Oklahoma City?